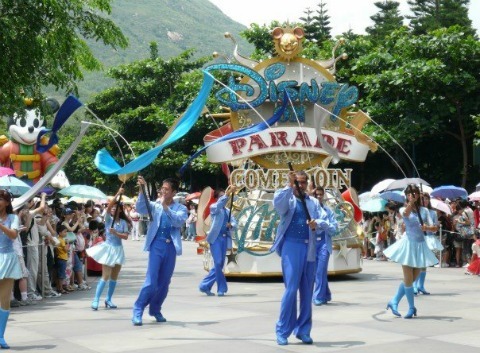 Hong Kong Disneyland is a Disney themed amusement park built on reclaimed land on the north eastern end of Lantau Island. It’s based on the Disneyland theme park in California, U.S.A. A few differences were made for this Chinese Disneyland, such as buildings facing a specific direction to promote good feng shui. Tickets to get in to the park can be purchased at the main entrance, online, from travel agents, or at Hong Kong Disneyland Ticket Express found at the Hong Kong MTR Station, Tung Chung Line Concourse. There are a few different types of tickets you can purchase to get into the park. You can buy a 1 Day Ticket which allows entrance to the park from open to close on one day. Another option is the 2 Day Pass which allows you to enter the park any 2 days within a 7 day period. Another option is the Magic Access Pass, an annual pass that offers members exclusive benefits. These benefits include discounts on merchandise in the stores and on food inside the park, limited edition gifts, exclusive park activities/experiences, and birthday specials. It’s a good idea to pick up a map of the park as soon as you enter Disneyland. When you look at the map, you’ll notice there are 5 separate sections of the park to explore. These are known as “lands.” The 5 lands of Hong Kong Disneyland are Fantasyland, Tomorrowland, Adventureland, Toy Story Land, and Main Street U.S.A. Each land has special themed rides, shopping, dining, and Disney themed shows for guests to enjoy. These 5 lands are very similar to the ones at Disneyland in California. Main Street U.S.A. is a part of Hong Kong Disneyland that everyone should see for themselves. Start your day with the Flights of Fantasy Parade, and come back at night to see the Disney in the Stars fireworks show. Keep an eye out for the Muppet Mobile Lab and see some of their new experiments. Stop by the Art of Animation and Animation Academy to get an insiders look at how animations come to life. Ride down Main Street in a vintage Main Street Vehicle. Climb aboard the steam train on the Hong Kong Disneyland Railroad to relax while you ride around the whole park. 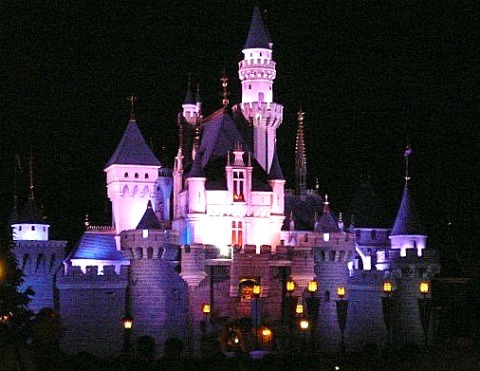 Fantasyland is the home of the iconic Sleeping Beauty Castle. Here you can meet your favourite Disney characters including Snow White, Cinderella, Sleeping Beauty, Belle, Mickey Mouse, Minnie Mouse, Winnie the Pooh, Tinker Bell and many more. You can also find popular Disneyland rides like “it’s a small world,” mad hatter tea cups, Dumbo the Flying Elephant, and the Cinderella Carousel. Visit the Disneyland Railroad Fantasyland Station to get to other areas of the park. Fantasyland also has many other activities, shows, and themed shopping centres. It’s all about space exploration at Tomorrowland. Popular Disneyland rides include Space Mountain, Buzz Lightyear Astro Blasters, Autopia, and Orbitron. Other activities in Tomorrowland include the Stitch Encounter, the UFO Zone and space themed shopping stores. If you’re looking for an exciting adventure, make your way to Adventureland. This land offers a Jungle River Cruise, Tarzan Island and Liki Tikis. Be sure to see a performance of Festival of The Lion King, a live-action theatrical show based on the animated movie The Lion King. A new section of Hong Kong Disneyland called Toy Story Land opened on November 18, 2011. Toy Story Land has many Toy Story themed activities including 3 brand new rides. Look for live street performances occurring daily throughout the park. If you’re unsure about what to see, or if you get lost easily, you may want to take advantage of the tour guides available on site. You can purchase a tour guide for the day to help show you around the park and find the best activities for your interests. Along with all the activities at the park, seasonal events & activities are put on throughout the year. These special events include Disney’s Haunted Halloween, Disney’s Sparkling Christmas, and a Chinese New Year celebration. The park will stay open late for some of these events. 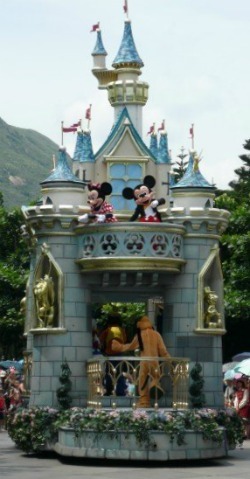 Hong Kong Disneyland is a very popular attraction among tourists from China. You may see a lot of tours from China depending when you go. The amusement park can get very crowded during the weekend, so try to plan a visit on a weekday so you won’t have to wait in line as long to get on rides you might want to ride on. Cast members can speak English, Cantonese and Mandarin. Audio guides are provided in English, Cantonese and Mandarin. Guide maps are provided in English, traditional and simplified Chinese, Japanese and French. Make your trip to Hong Kong Disneyland more memorable by staying at one of the 2 hotels found inside the Disneyland Resort. 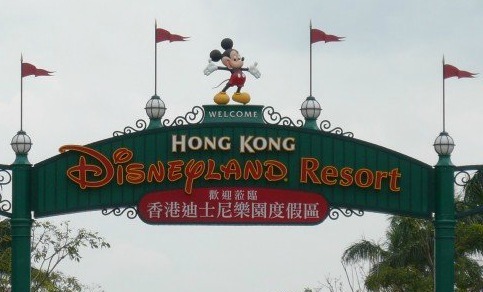 These 2 hotels are the Disneyland Hotel Hong Kong and Disney’s Hollywood Hotel which are only about a 10-15 minute walk from the park. If the 2 Disneyland hotels aren’t what you’re looking for, you can stay at the Regal Airport Hotel or one of the other 2 hotels located close to the Hong Kong International Airport. There’s a special Disneyland MTR line that goes from the Sunny Bay MTR Station directly to the Disneyland Resort MTR Station. The trains that run along this line have a special Disney theme that makes them different from the rest of the MTR trains. You’ll notice the windows on the trains are shaped like Mickey Mouse. When you get off at the Disneyland Resort Station, it’s just a short walk to the park from here. The park’s hours of operation are from 10:00am to 8:00pm, but are known to change on a regular basis. The best way to find out what time the theme park opens and closes at is to visit the Official Hong Kong Disneyland website. Here you can find a calendar with updated hours of operation. If you’re looking for other things to do that are close by, you’ll find Ngong Ping 360, Tian Tan Buddha, Citygate Outlets, Hong Kong International Airport, and AsiaWorld Expo.